Hyperikon proudly presents its premium line of LED T8 bulbs - setting the standard for excellence in the world of LED lighting. Our T8 LEDs come in a wide array of color-, size- and compatibility variations and we constantly seek to improve and develop state-of-the-art LED bulbs and tubes in order to exceed our customers' expectations. • BallastCompatible® available in 4FT. 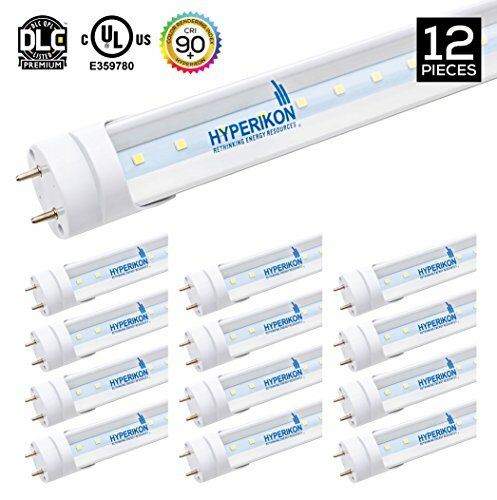 All other T8 LED tubes in 2FT, 4FT and 8FT. ✔ SAVE 60% INSTANTLY - Save 60% on your electricity bill! Replace 45W fluorescent tubes with 18W LED. ✔ CRI90+, BRING OUTDOOR LIGHT INDOORS - Hyperikon's CRI90+ technology provides near-sunlight quality light for true color rendering and consistency inside your office, warehouse or industrial space. Have sunlight on a cloudy day!